Prescribed drugs currently used for arthritis pain relief has been known to raise the risk of heart attacks in one out of five people, specifically those who have had major operations in recent years. Now, according to Chemist Direct, scientists said they have found alternative remedies which can alleviate most pain with minimal side-effects. 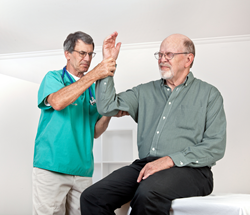 Osteoarthritis affects almost half the UK’s older population. It develops as cartilage is worn down in the hips, knee and wrist joint and can make tasks like opening jars, holding cutlery and tying shoelaces near to impossible. Lifestyle changes are the preferred treatment for osteoarthritis and other types of joint swelling. Exercise can help relieve stiffness, reduce pain and fatigue, and improve muscle and bone strength. Medicines may be prescribed along with lifestyle changes but all medicines have some risks. Scientists have also found a way to stop nerve cells in diseased joints sensing pain without inducing common side effects. They say their discovery could drastically cut the number of knee and hip replacements performed in Britain each year which is currently around 160,000, and costs the NHS almost £200million. Danish researchers found the specially cultivated compound called Gopo reduced nagging pain in nine out of 10 of the 30 people who took part in clinical trials. These trials suggest this key ingredient of the rosehip plant may provide a breakthrough alternative treatment for six million Britons whose lives are blighted by joint pain. Pills containing the supplement are now available in the UK at a cost-efficient 15p each. The results of these investigations carried out at Frederiksberg University in Copenhagen and published in the Open Journal of Rheumatology and Autoimmune Disease http://bit.ly/PW8wik show the natural extract of rosehip could offer the closest thing to a cure. Scientists from the Arthritis Research UK Pain Centre at Nottingham University had impressive results in reducing joint pain by targeting a nerve cell pain receptor called TRPV1. This latest study was published in the March edition of the journal Annals Of The Rheumatic Diseases. http://bit.ly/1i4DqM5 Previous trials on osteoarthritis patients showed their pain could be cut by blocking the receptor using drugs called TRPV1 antagonists. But the patients experienced the side effect of hyperthermia in their digestive organs when the medicine was administered orally.